Spring has sprung with a fabulous Daily Vintage Attire video featuring the beautiful pinup outfit I wore today. I decided to make this video a little different to my usual attire videos and including the process of getting ready with makeup, followed by hair styling, the outfit and then accessorising! Blouse and hat: op shop finds. Gloves, earrings and brooch: beautiful gifts from beautiful people in my life. My next fabulous video will be out on Tuesday, subscribe for more vintage fun! 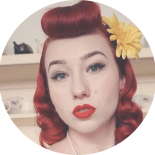 This entry was posted on September 1, 2018 by Miss Lady Lace in daily vintage attire, Pinup, Videos, Vintage Fashion, YouTube and tagged 1940's, 1950's, blogger, daily vintage attire, glamour, miss lady lace, miss lady laces pinup blog, perth, perth pinup, perth pinup blog, perth pinup community, pin up, pinup, pinup blog, pinup blogger, pinup fashion, pinup girl, pinup life, pinup lifestyle, pinup perth, red lips, retro blog, retro girl, retro glamour, the perth pinup community, victory rolls, vintage, vintage blog, vintage blogger, vintage fashion, vintage girl, vintage glamour, vintage perth, vintage pinup blog.